Set on one of the best double plots in urbanicacion Hacienda Las Chapas with total privacy and panoramic sea views, this unique contemporary style villa offers all the best! Captivating contemporary new built villa in La Alqueria (Benahavis). 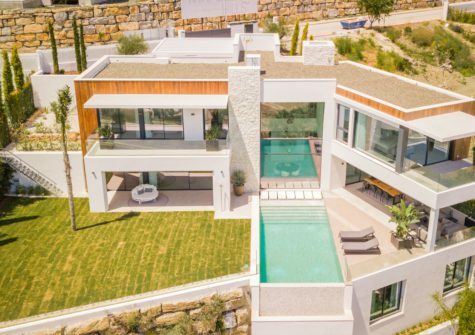 This luxurious villa, designed by Carlos Lamas, is located on one of the best parts of La Alqueria, a quiet and peaceful location, offering breath-taking panoramic views. Spectacular 6 bedroom contemporary villa with amazing panoramic views on golf and Mediterranean. As of its orientation, it offers unblocked views from all floors towards Gibraltar and the African continent.